It is a beautiful sunny Sunday and later on my family of three is hosting a small BBQ with my mom and her Husband. We are providing the burgers and fixin's and they are bringing corn and adult beverages. As I was making sure we had enough buns I got to thinking that the feast was missing the quintessential BBQ side: pasta salad! Too bad my husband already nixed that option the night before. So I got to thinking what else can I make? Then the idea came to me to use my fresh herbs I planted yesterday! BINGO! 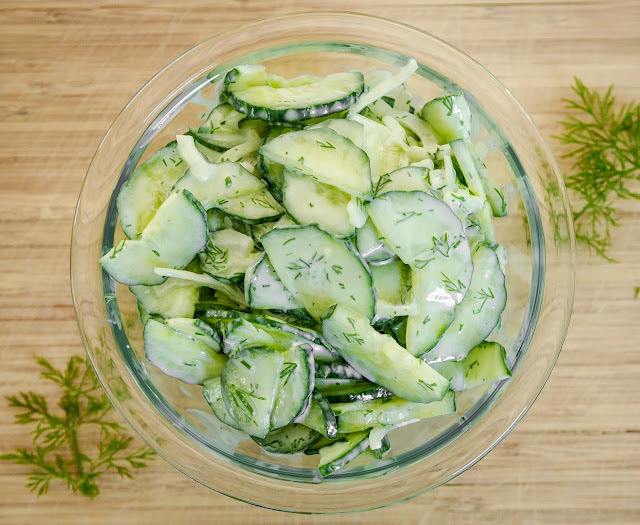 I'll make a cucumber and dill salad! This super easy and yummy side is not only a crowd pleaser but it's super healthy too! No mayo or pasta and no need to spend hours with the oven on during the hot summer day. All you need is a large cucumber, fresh dill, half a sweet onion, greek yogurt, and salt and you will have yourself a nice and light BBQ side! Take your large cucumber and cut it in half length wise. Then take each half and thinly slice it. Next, take your onion and cut it in half length wise and slice one half of that very very thinly and toss in the bowl with the cucumbers. Sprinkle in about 2 tsp of salt. I use Himalayan pink salt, but any will do, and toss it all together. Next add 3 table spoons of non-fat Greek Yogurt and mix. If you have fresh dill from your garden that is great, if not take some fresh dill from the store and pluck it off the stems. Finely chop it and toss it in with the rest of the salad. You can either serve it right away or toss some saran rap over it and serve it later on. This is such a great side to bring to any sort of gathering. It's very fresh and light, healthy, and easy to prepare! Great recipe. This looks fresh and delicious. I'm always looking for easy recipes that my daughters can make. Thank you for sharing. Stopping by from the Mommy Mondays blog hop. Mmm. 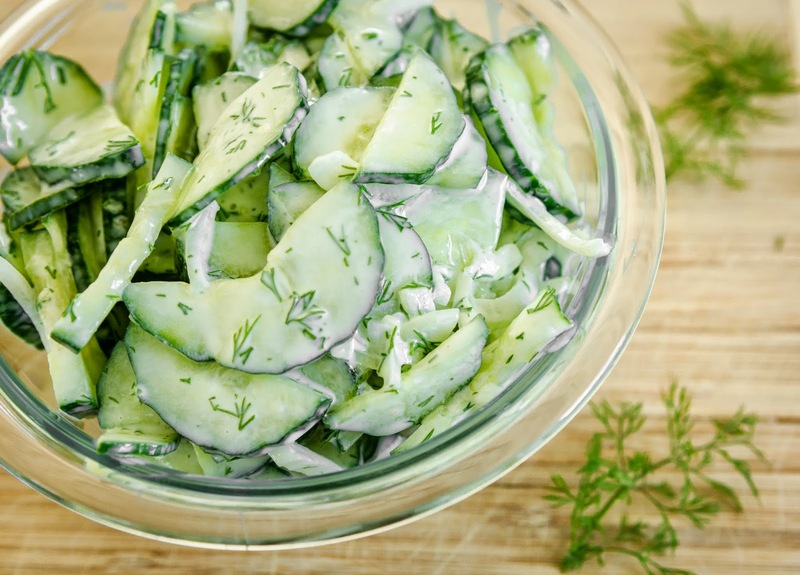 We love dill and cucumber combos. So refreshing in the summer. I wish I had space to grow my own! How funny, I made something similar for lunch yesterday. I like the greek yogurt aspect of it though! Oh YUM! Thanks for sharing with us at Mommy Monday!! The 21 day fix says 1G but what about the yogurt? Do I not need to count it because it's a small amount? 3/4 cups of greek yogurt counts as a red container which equates to 12 tablespoons. So, you should count it as .25 of a red container. How many servings does this recipe make?? How many servings does this count as? I just made this with an english cucumber and it was VERY salty. 2 Tsp is WAY too much. Is this a typo in the recipe? Or is there an amount of cucumber this is supposed to be for (# of cups)? Thanks! Very refreshing...thank you for sharing this recipe! Made this for a family bbq and everyone loved it. It seemed salty at first but I made it the night before and the saltiness seemed to dissipate. It really is very very nice and refreshing. For JT. A small t. indicates teaspoon as does tsp. A capital T. indicates Tablespoon as does tbsp. The reader used parts of both abbreviations and in doing so confused herself.